This book presents a treatment of the theory of \(L\)-functions developed by means of the theory of Eisenstein series and their Fourier coefficients, a theory which is usually referred to as the Langlands–Shahidi method. The information gathered from this method, when combined with the converse theorems of Cogdell and Piatetski-Shapiro, has been quite sufficient in establishing a number of new cases of Langlands functoriality conjecture; at present, some of these cases cannot be obtained by any other method. These results have led to far-reaching new estimates for Hecke eigenvalues of Maass forms, as well as definitive solutions to certain problems in analytic and algebraic number theory. This book gives a detailed treatment of important parts of this theory, including a rather complete proof of Casselman–Shalika's formula for unramified Whittaker functions as well as a general treatment of the theory of intertwining operators. It also covers in some detail the global aspects of the method as well as some of its applications to group representations and harmonic analysis. This book is addressed to graduate students and researchers who are interested in the Langlands program in automorphic forms and its connections with number theory. Graduate students and research mathematicians interested in automorphic forms and \(L\)-functions, number theory, and representation theory. Written by one of the main players in the game, Eisenstein Series and Automorphic L-functions is nigh on indispensable for anyone wishing to get into this beautiful and exciting part of number theory. 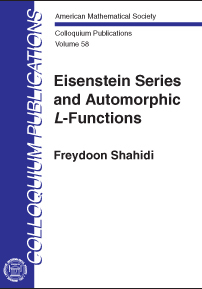 A glance at the table of contents of Freydoon Shahidi's book shows that it is something of a pedagogical dream: it seems to cover just about everything one might want to learn about the interface between automorphic representations and L-functions - a theme of huge importance in number theory in the last 50 years. Of course, there is more to the subject than can be covered in the book's 200 pages, but Shahidi touches on a great number of critically important topics, arranges them extremely efficiently, and then expounds them brilliantly. . . . I cannot imagine a better trajectory toward learning this material than to go through the pages of Eisenstein Series and Automorphic L-functions with a lot of note paper handy and a comfortable writing pen, to follow up on Shahidi's numerous cross-references when so indicated (and to the right degree, so to speak), and of course to fill out the sketches and do the exercises that the author presents. This very beautiful mathematics is well worth the effort.